Blind spot cameras for cleaning vehicles? Many stops, accelerating, braking and slow driving in urban areas characterize the driving behaviour of public services – cleaning vehicles and garbage trucks. Good visibility is of great importance in the waste sector. 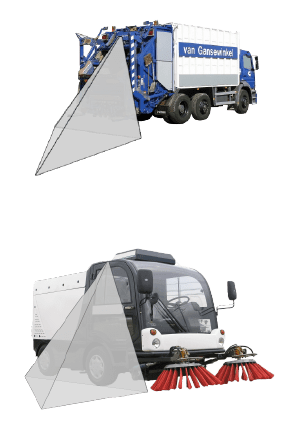 Within the environmentally sector the European safety standard BS EN1501 requires a rear view camera for garbage trucks. Van Zwitserland BV can advise on legal requirements and ensure the right products. Van Zwitzerland BV has recently conducted a large project for Van Gansewinkel. More than 80 garbage trucks are equipped with a rear view camera and blind spot camera. In our business cases you can read more about this project. Please contact Van Zwitserland via the contact form or by simply calling 015-2125111. One of our colleagues will look with you into the best possible solution for your cleaning vehicles. If you don’t need advice from one of our staff members and / or you have the knowledge and manpower for the installation. Then we recommend the VZ 207W Pro Achteruitrijdcamera Set, which you can order simply direct online.